I'll start by saying that I didn't take even 1 picture this whole week. Is that possible? I guess I was pictured out after our vacation. I'll have to make friends with my camera again this week. That said... Nick, my husband did take 2 pictures this week. So... I'll share one of those. A little background... Our friend Mark is currently living in Australia. He and his girlfriend Lara moved there temporarily(?) with no date for a planned move back. It gives us a great reason for a trip to Australia, but I doubt we'll be loading Zoe on a plane to go visit anytime soon. (could you imagine a toddler on that flight?) Anyway, Mark is back visiting and came over last week. They were doing some recording (our basement is where my husband's band records and plays). Zoe loves to go down and play with as many instruments as she can get her hands on. Mark brought dinner with him... and while the guys were all chatting Zoe decided to steal a snack. Technically it's not a great picture... but how funny is that? 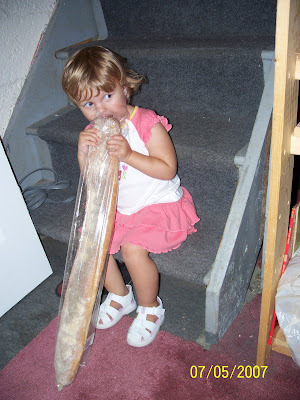 She just swiped that huge loaf of french bread and started to munch. The thing is as tall as she is! If you're interested in looking at some other "best shots" head over to Picture This!